Drs. Yong-Rak Kim, Joseph Turner, and civil engineering graduate student Mahdieh Khedmati. With funding from the National Science Foundation, Dr. Yong-Rak Kim is leading a multi-disciplinary research team to understand binding of concrete. Kim’s team has found promising alternatives to conventional cement-based concrete. Traditionally, water and cement bond with aggregates such as rock and sand to form concrete. This project looked at a geopolymer mixture of alkaline solution and fly ash - a byproduct of coal production - in place of water and cement. The result is a more environmentally friendly binding material. The mixture of alkaline activators and fly ash is also better suited for recycled aggregates - concrete construction and demolition wastes that would otherwise end up in landfills. In cement concrete, water can cause a ‘wet wall’ on aggregates that can create an imperfect bond, making weaker concrete. The alkaline activator in geopolymer can penetrate the incomplete bonds and cure. The result is a concrete that is as strong as, or even stronger than, traditional cement concrete. “Geopolymer technology is nothing new. It’s the same concept used to repair damaged teeth and bone in the medical field,” said Kim. Using small-scale nanoindentation, microscopic imaging and chemical mapping, Kim is able to examine the geopolymer mixtures in nano to micro levels, which are quantified and scaled to a larger model. Other materials such as slag, a byproduct of steel manufacturing, were also examined, and Kim believes the future binders and blends can be better designed and developed. Kim also predicts this will be more cost effective, as byproducts are readily available from industrial productions. 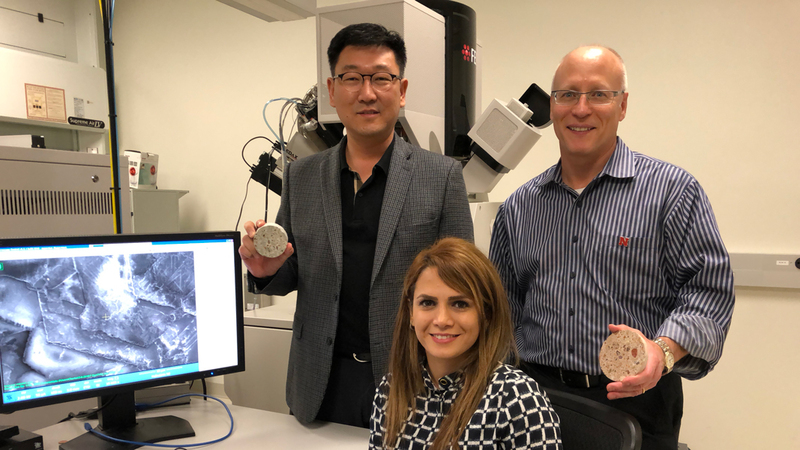 This project wraps up 30-month NSF grant awarded to Kim and co-principle investigator Dr. Joseph Turner in the Department of Mechanical & Materials Engineering. The team has already published four papers with more on the way listed as ‘high impact’ to society, including a recent article published in the Composites B: Engineering. The next step for them will be to examine more durable and multifunctional construction materials. 114 Othmer Hall/820 N 16th St.